Never in a million years did I think I would have to tell this story-now I feel like it’s my time to let this all out of my heart. My husband and I have been together since May 2000 and we got married in November 2006. I was a package deal-I have two boys from a previous marriage and all they knew about their father was that he was abusive and we left. When Dan came into my life he came into my boys’ life and we have never been apart. It takes a lot for one man to love another man’s children and he did just that and it’s been magical ever since. We would never leave each other’s side and we are and will always be best friends. We decided to try and get pregnant in May 2007. It happened fairly quickly-July is here and I am on the phone with my sister. Out of the blue I decided to pee on a stick and with her on the phone I pee. I did not tell her what I was doing and she commented how gross I was for peeing and talking on the phone at the same time. We started laughing and I laid the stick down on the countertop. As I go to wash my hands I look over and couldn’t believe that I was staring at a pink cross! I started screaming and my sister is yelling at me thinking that I am being attacked! I finally get some composure and tell her in between gasps I am pregnant! We both start screaming and crying! I will never forget that moment-the pure shock of it all and the euphoria of knowing that I have life growing inside of me. In that second I was completely and 100% in love. It’s a moment in time that I will treasure always. Now I had to wait for my husband to come home from his trip. When he walked in through the front door it took all I had not to jump in his arms and scream we are having a baby! So instead as a calm rational person I gave him a present that had a pair of baby booties and my pregnancy test. He knew before he even opened it what it was and the look on his face was priceless! I just had to say it out loud..We are having a baby! And it was wonderful-when we hugged and he touched my belly…I wanted to re-live that moment over and over again. I scheduled an appt with my doctor that following week just to verify that I was indeed pregnant. We both went in together and they did a blood test to confirm that I was pregnant and my doctor wanted to do a quick ultrasound to see if there was a sac that was visible. We went in and did the ultrasound and she wasn’t able to find a sac but said it was just too early to see anything and to come back in two weeks. Not a problem. Over the next two weeks I wasn’t having any symptoms but I did notice that my belly was getting bigger. It was weird-I was only about 6 weeks along and I couldn’t possibly be showing. The only thing I could think of was that it might be twins since they run on my side of the family-my mom’s aunt is a twin. I started rolling that idea around in my head and tossed it to my husband who promptly freaked out. Typical right? Friday, July 27, 2007-one of the saddest days of my life. We just came back from a sales outing at a great restaurant and I was getting ready to head home for the weekend. I stopped to use the bathroom real quick and saw blood on my underpants. In that second I knew. I just knew that I had lost the baby. I still to this day can’t explain it but something in me broke and all the sadness and loneliness I could possibly imagine rested on my shoulders and I felt so lost and so tiny. I immediately went home and sat down with my husband to tell him about the bleeding. He was optimistic and tried to cheer me up. He did the best he could but it wasn’t working. I just had to go to the hospital and find out what is going on. It was the longest car ride of my life and sitting in that ER room was so sad and so depressing. I kept my hand on my belly and rubbed it and it didn’t matter all the thoughts that were running through my head-I knew it was over. The ultrasound was so incredibly lonely and sad. I couldn’t have my husband in their with me and the technician wasn’t allowed to say anything to me. All he was allowed to do was give the results to my doctor and they had to relay the results to me. And it was confirmed it three short words. “I am sorry”. That was all it took for me to break down and cry. And I had to walk to my husband and tell him the news-I couldn’t believe it. Everything that I had hoped for and everything that I wished for was gone. 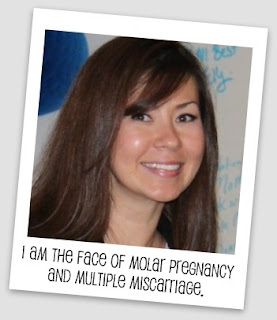 And to make matters worse-I had a molar pregnancy which happens in 1 out of 2000 pregnancies. And after my scheduled D&C, I had a regrowth of the cells that was left over from my molar pregnancy so I had to take methotrexate and they treated this growth of cells like it was cancer. And thus started the year long wait and endless doctor visits and dozens of blood tests. By October of 2008 I was done. I was broke inside and every friend’s pregnancy broke my heart a little more each day. I felt like there was no end in sight and we were never going to have a baby.